I should have kept off the computer today and been resting my arm but I got a bit carried away with this little project in Publisher. It’s one prototype. I shall need to do something bolder as an alternative. Tomorrow I’ll mock something up in PSP. 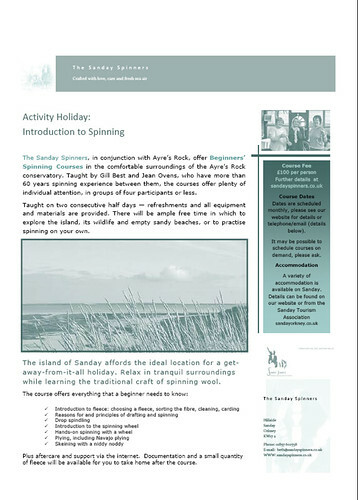 If it’s too small to read: it is a flyer to promote the Sanday Spinners’ new Introduction to Spinning course. We are selling the island idyll concept (I hope.) A joint effort between the spinners and the island’s accommodation providers, we hope that it will be a successful venture for all concerned. The Sanday Spinners’ website is coming along nicely too. Should be ready for launch soon. We are attempting to get a shift on with it on Saturday evening. The PayPal account is ready to go but there is a large job to be done in uploading stock, descriptions, and photos. Oh, and a small matter of getting some spinning done, of course! And now I am going to switch off and do something less stupid instead.